The ErtelAlsop Vapor-Master enclosed plate and frame filter press permits filtration of harmful fluids in a completely sealed, vapor-tight environment for both venting and for the safe disposal or recovery of filtrate and cake residue. This patented design eliminates exposure of workers to toxic vapors from solvents used in cake washing during the extraction process. Filtration units can be custom designed and manufactured to specific requirements such as provision for modified clean-in-place procedures(CIP). Various forms of filter media are acceptable for use in the Vapor-Master, including filter sheets or filter paper. The Vapor-Master hood can be closed manually or with an optional joystick system. 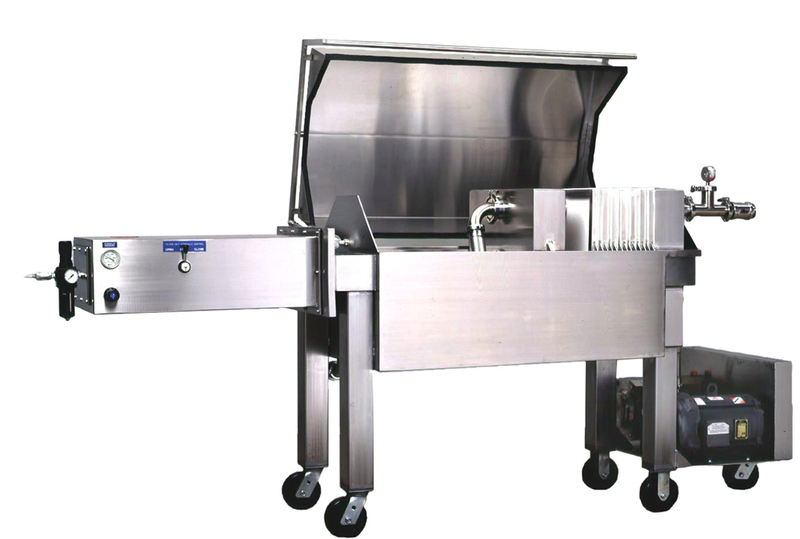 Dual stainless steel and Teflon® pistons provide smooth operation and maintain accurate hood alignment. The self-aligning stainless steel cover has a precision machined sealing rim and tight sealing gasket. The entire perimeter is covered by an ErtelAlsop designed Viton seal. Other gasket material can be supplied. For applications requiring cake recovery from the Vapor-Master, we offer the addition of a Mobile Cake Recovery Module. This portable cake pan seals in place to the bottom of the Vapor-Master enclosure with a locking cam during the filtration run. At the end of the cycle, when the filter cake is removed, the module can be released from the bottom of the unit and moved away for further processing.